PAUL BISHOP ~ WRITER: BOOK TALK WITH GINGER DAWN PODCAST! BOOK TALK WITH GINGER DAWN PODCAST! This week on Book Talk with Ginger Dawn get ready to grab your boxing gloves and step into the ring! Mob fixed fights, Rocky Graziano and Tony Zale , Chicago where "the thick air hung heavy with the scent of stale cigarette smoke and fermenting beer." Ka Powie! 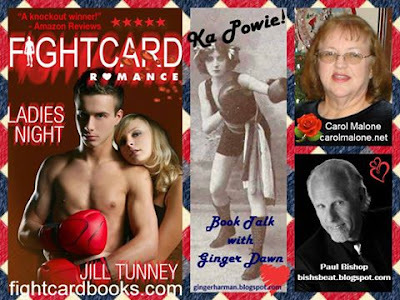 FIGHT CARD ROMANCE: LADIES NIGHT! IT’S NO PALOOKA!